The blend of nutty, milky and salty flavors makes this a purely refreshing summer salad. Feta can also be used. The fleur de sel becomes an ingredient in its own right in a salad such as this, where its crunch and mineral taste acts as a counterpoint to the sweet juiciness of the watermelon. Use extra vinaigrette on corn on the cob, brush on meats after they come off the grill, or toss with thinly sliced refrigerated cucumbers. For the vinaigrette: Place the shallot, vinegars, and thyme in a small bowl and allow the shallots to “bloom” (macerate) for 30 minutes. Drizzle the olive oil into the vinegar, whisking to emulsify. Season with salt and pepper. For the salad: Place the serrano ham slices on a baking sheet, invert another baking sheet on top and bake until crisp, 5 to 8 minutes. Remove from the baking sheet and cool. Combine the watercress, watermelon, ricotta salata, and pine nuts in a large salad bowl. Dress the salad starting with about 1/4 cup of the vinaigrette, adding more vinaigrette as needed, 1 tablespoon at a time, to lightly coat ingredients. Divide the salad onto 6 chilled salad plates. 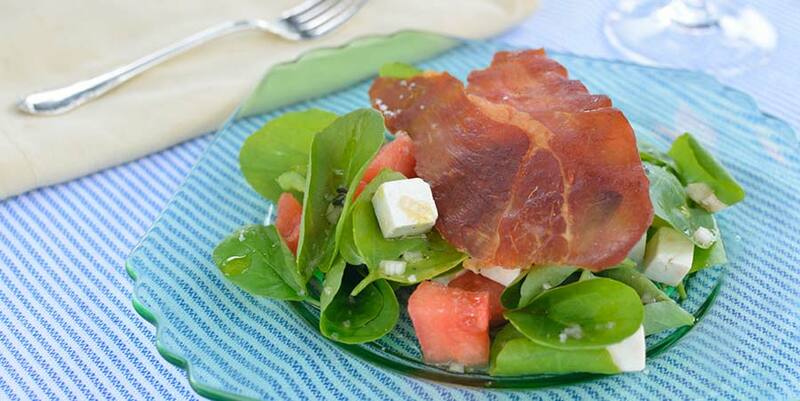 Sprinkle with fleur de sel and top each salad with a slice of crisp serrano ham. 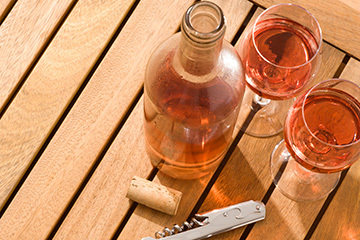 Perfect with a pale, dry rosé wine to echo the watermelon color and the peppery watercress.